I thought about this dish for the holidays because growing up in Brooklyn, many of my Italian childhood friends would celebrate Christmas Eve with a Feast of the Seven Fishes. Most of the dishes were seafood or shellfish and then there was one dish of salt cod or baccala that all my friends would make a stink about. They hated this fish. They said it smelled, tasted bad. I never tasted it as given their critique it never became high on my list to eat. But it was tradition, so their families served it to them on Christmas eve. 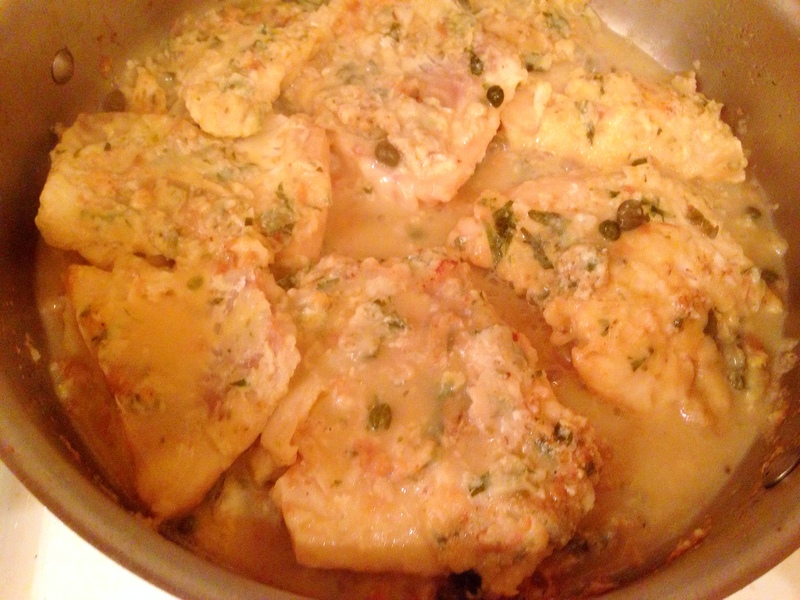 In trying to keep with the thought of tradition, yet providing a tastier alternative here is a recipe for cod with leon caper sauce. It’s not a recipe for salt cod, but rather fresh cod. What is great about this fish is that it’s study and holds up well with sautéing and braising. The fish is dipped in a seasoned egg mixture, Einkorn flour and then again back in the egg to give a bit of batter-like coating. It’s sautéed with little oil and butter for a few minutes and then taken out of the pan for the sauce to be created and then put back into the pan for a few minutes to coat with the sauce. It’s quick and easy, you just need to be careful to not overcook the fish. Make egg mixture with egg, water, 1 garlic clove grated, ¼ cup parsley. Mix through. To the flour add the oregano and mix through. Salt and pepper both sides of the fillets then dip each into the egg mixture, then the flour, then the egg mixture again, coating both sides at each stage. In a saute pan, heat the butter and olive oil. Saute the fillets 3 minutes on each side. You may need to do this in two batches. Move fish onto plate. To pan add stock and deglaze the bits from the pan to incorporate into sauce. Add wine and lemon juice, grated garlic clove, and capers. Cover and simmer 15 minutes until sauce is reduced a bit and thickened. Uncover and add filets turning to coat, cover pan and cook for 3 minutes. Remove filets from pan and our sauce on top, garnish with remaining parsley and serve. 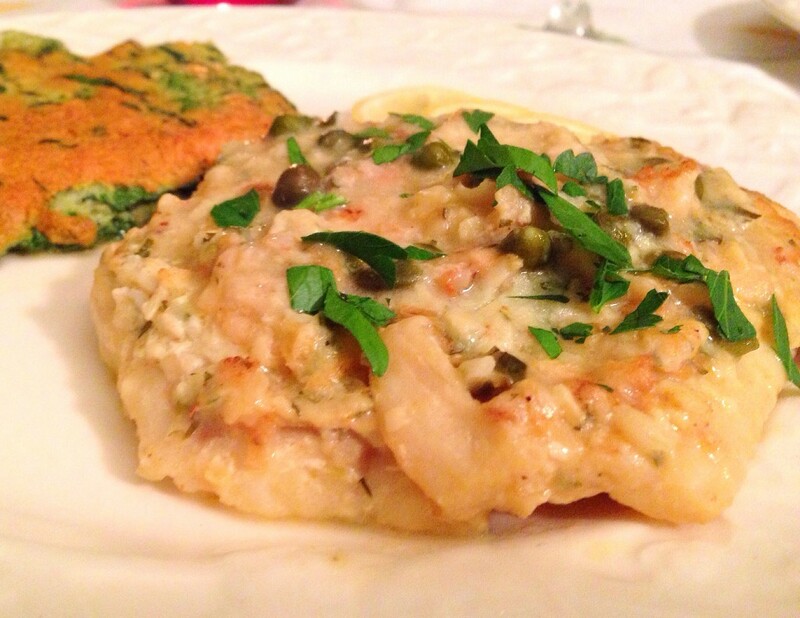 This entry was posted in Blog, Recipes on December 15, 2013 by Leslie. I agree, perhaps baccala should be added to the “acquired taste” list but, prepared well it IS delicious. Soaked in fresh water (changed daily) for at least 3 to 4 days, the rehydrated cod becomes plump and fresh-looking. I make it every year for my Feast of the Seven Fishes. One way is as a cold salad, cooked and chilled and sprinkled with lots of lemon juice, chopped garlic and fresh Italian parsley. I also serve it as a zuppa (soup/stew) with the chunks of baccala cooked in a tomato based sauce with onions, celery and potatoes. You’ll have to join us sometime! Thanks for sharing Nancy! Enjoy your Feast!